Lake Buena Vista and Bay Lake, Florida, U.S. Designed to supplement Disneyland, in Anaheim, California, which had opened in 1955, the complex was developed by Walt Disney in the 1960s. "The Florida Project", as it was known, was intended to present a distinct vision with its own diverse set of attractions. Walt Disney's original plans also called for the inclusion of an "Experimental Prototype Community of Tomorrow" (EPCOT), a planned community intended to serve as a test bed for new city-living innovations. Walt Disney died on December 15, 1966, during construction of the complex. Without him spearheading the construction, the company built a resort similar to Disneyland, abandoning the experimental concepts for a planned community. Magic Kingdom was the first theme park to open in the complex, in 1971, followed by Epcot (1982), Disney's Hollywood Studios (1989), and Disney's Animal Kingdom (1998). Today, Walt Disney World is the most visited vacation resort in the world, with average annual attendance of more than 52 million. The resort is the flagship destination of Disney's worldwide corporate enterprise and has become a popular staple in American culture. In 1959, Walt Disney Productions began looking for land to house a second resort to supplement Disneyland in Anaheim, California, which had opened in 1955. Market surveys at the time revealed that only 5% of Disneyland's visitors came from east of the Mississippi River, where 75% of the population of the United States lived. Additionally, Walt Disney disliked the businesses that had sprung up around Disneyland and wanted more control over a larger area of land in the next project. Walt Disney flew over a potential site in Orlando, Florida – one of many – in November 1963. After witnessing the well-developed network of roads and taking the planned construction of both Interstate 4 and Florida's Turnpike into account, with McCoy Air Force Base (later Orlando International Airport) to the east, Disney selected a centrally-located site near Bay Lake. To avoid a burst of land speculation, Walt Disney World Company used various dummy corporations to acquire 30,500 acres (48 sq mi; 123 km2) of land. In May 1965, some of these major land transactions were recorded a few miles southwest of Orlando in Osceola County. In addition, two large tracts totaling $1.5 million were sold, and smaller tracts of flatlands and cattle pastures were purchased by exotically-named companies such as the "Ayefour Corporation", "Latin-American Development and Management Corporation" and the "Reedy Creek Ranch Corporation". Some are now memorialized on a window above Main Street, U.S.A. in Magic Kingdom. The smaller parcels of land acquired were called "outs". They were 5-acre (2 ha) lots platted in 1912 by the Munger Land Company and sold to investors. 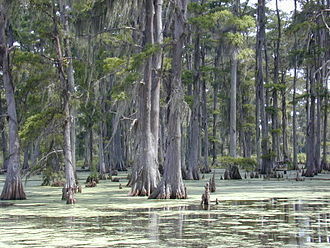 Most of the owners in the 1960s were happy to get rid of the land, which was mostly swamp at the time. 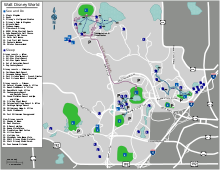 Another issue was the mineral rights to the land, which were owned by Tufts University. Without the transfer of these rights, Tufts could come in at any time and demand the removal of buildings to obtain minerals. Eventually, Disney's team negotiated a deal with Tufts to buy the mineral rights for $15,000. Working strictly in secrecy, real estate agents unaware of their client's identity began making offers to landowners in April 1964 in parts of southwest Orange and northwest Osceola counties. The agents were careful not to reveal the extent of their intentions, and they were able to negotiate numerous land contracts with some including large tracts of land for as little as $100 an acre. With the understanding that the recording of the first deeds would trigger intense public scrutiny, Disney delayed the filing of paperwork until a large portion of the land was under contract. Early rumors and speculation about the land purchases assumed possible development by NASA in support of the nearby Kennedy Space Center, as well as references to other famous investors such as Ford, the Rockefellers, and Howard Hughes. An Orlando Sentinel news article published weeks later on May 20, 1965, acknowledged a popular rumor that Disney was building an "East Coast" version of Disneyland. However, the publication denied its accuracy based on an earlier interview with Disney at Kennedy Space Center, in which he claimed a $50 million investment was in the works for Disneyland, and that he had no interest in building a new park. In October 1965, editor Emily Bavar from the Sentinel visited Disneyland during the park's 10th-anniversary celebration. In an interview with Disney, she asked him if he was behind recent land purchases in Central Florida; Bavar later described that Disney "looked like I had thrown a bucket of water in his face" before denying the story. His reaction, combined with other research obtained during her Anaheim visit, led Bavar to author a story on October 21, 1965, where she predicted that Disney was building a second theme park in Florida. Three days later after gathering more information from various sources, the Sentinel published another article headlined, "We Say: 'Mystery Industry' Is Disney". Walt Disney had originally planned to publicly reveal Disney World on November 15, 1965, but in light of the Sentinel story, Disney asked Florida Governor Haydon Burns to confirm the story on October 25. His announcement called the new theme park "the greatest attraction in the history of Florida". The official reveal was kept on the previously-planned November 15 date, and Disney joined Burns in Orlando for the event. 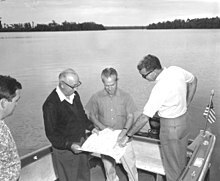 Roy O. Disney inspecting design plans on-site in Florida. Walt Disney died from circulatory collapse caused by lung cancer on December 15, 1966, before his vision was realized. His brother and business partner, Roy O. Disney, postponed his retirement to oversee construction of the resort's first phase. On February 2, 1967, Roy O. Disney held a press conference at the Park Theatres in Winter Park, Florida. The role of EPCOT was emphasized in the film that was played. After the film, it was explained that for Disney World, including EPCOT, to succeed, a special district would have to be formed: the Reedy Creek Improvement District with two cities inside it, Bay Lake and Reedy Creek, now Lake Buena Vista. In addition to the standard powers of an incorporated city, which include the issuance of tax-free bonds, the district would have immunity from any current or future county or state land-use laws. The only areas where the district had to submit to the county and state would be property taxes and elevator inspections. The legislation forming the district and the two cities was signed into law by Florida Governor Claude R. Kirk, Jr. on May 12, 1967. The Supreme Court of Florida then ruled in 1968 that the district was allowed to issue tax-exempt bonds for public projects within the district, despite the sole beneficiary being Walt Disney Productions. The district soon began construction of drainage canals, and Disney built the first roads and the Magic Kingdom. The Contemporary Resort Hotel and Polynesian Village were also completed in time for the park's opening on October 1, 1971. The Palm and Magnolia golf courses near Magic Kingdom had opened a few weeks before, while Fort Wilderness opened a month later. 24 days after the park opened, Roy O. Disney dedicated the property and declared that it would be known as "Walt Disney World" in his brother's honor. In his own words: "Everyone has heard of Ford cars. But have they all heard of Henry Ford, who started it all? Walt Disney World is in memory of the man who started it all, so people will know his name as long as Walt Disney World is here." After the dedication, Roy Disney asked Walt's widow, Lillian, what she thought of Walt Disney World. According to biographer Bob Thomas, she responded, "I think Walt would have approved." Roy Disney died at age 78 on December 20, 1971, less than three months after the property opened. Admission prices in 1971 were $3.50 for adults, $2.50 for juniors under age 18, and one dollar for children under twelve. Much of Walt Disney's plans for his Progress City were abandoned after his death and after the company board decided that it did not want to be in the business of running a city. The concept evolved into the resort's second theme park, EPCOT Center, which opened in 1982 (renamed EPCOT in 1996). While still emulating Walt Disney's original idea of showcasing new technology, the park is closer to a world's fair than a "community of tomorrow". One of EPCOT's main attractions is their world's showcase which highlights 11 countries across the globe. Some of the urban planning concepts from the original idea of EPCOT would instead be integrated into the community of Celebration much later. 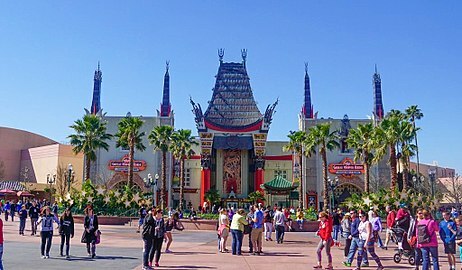 The resort's third theme park, Disney-MGM Studios (renamed Disney's Hollywood Studios in 2008), opened in 1989 and is inspired by show business. The resort's fourth theme park, Disney's Animal Kingdom, opened in 1998. George Kalogridis was named president of the resort in December 2012, replacing Meg Crofton, who had overseen the site since 2006. On January 21, 2016, the resort's management structure was changed, with general managers within a theme park being in charge of an area or land, instead of on a functional basis as previously. Theme parks have already had a vice-president overseeing them. Disney Springs and Disney Sports were also affected. Now hotel general managers manage a single hotel instead of some managing multiple hotels. On October 18, 2017, it was announced that resort visitors could bring dogs to Disney's Yacht Club Resort, Disney's Port Orleans Resort – Riverside, Disney's Art of Animation Resort and Disney's Fort Wilderness Resort & Campground. Hurricane Floyd closes the resort for the first time in its history on September 15. On September 11, a series of terrorist attacks closes the resort for the second time due to national safety concerns. Hurricane Frances closes the resort for the third time from September 4 to 5. 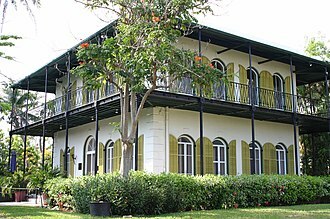 Hurricane Jeanne closes the resort for the fourth time on September 26. Hurricane Matthew closes the resort for the fifth time on October 7. Hurricane Irma closes the resort for the sixth time from September 10 to 11. Star Wars: Galaxy's Edge due to open at Disney's Hollywood Studios on August 29, 2019. Mickey & Minnie's Runaway Railway is replacing The Great Movie Ride, opening at Disney's Hollywood Studios in 2019. Disney Skyliner, a new gondola lift style transportation system opens in fall 2019. Select cabins will feature Disney characters on the exterior and will give guests the ability to travel to Epcot, Disney’s Hollywood Studios and four Disney resorts: Art of Animation, Caribbean Beach, Pop Century, and the new Riviera Resort. The Florida resort is not within Orlando city limits but is southwest of Downtown Orlando. Much of the resort is in southwestern Orange County, with the remainder in adjacent Osceola County. The property includes the cities of Lake Buena Vista and Bay Lake which are governed by the Reedy Creek Improvement District. The site is accessible from Central Florida's Interstate 4 via Exits 62B (World Drive), 64B (US 192 West), 65B (Osceola Parkway West), 67B (SR 536 West), and 68 (SR 535 North), and Exit 8 on SR 429, the Western Expressway. 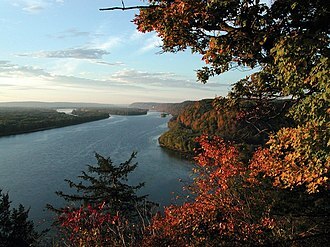 At its founding, the resort occupied approximately 30,500 acres (48 sq mi; 123 km2). Portions of the property have since been sold or de-annexed, including land now occupied by the Disney-built community of Celebration. Now the resort occupies nearly 25,000 acres (39 sq mi; 101 km2). The Walt Disney World Railroad. Disney's Boardwalk, located outside of their Boardwalk Inn, functions as an entertainment, dining, and shopping district. Disney's property includes four golf courses. The three 18-hole golf courses are Disney's Palm (4.5 stars), Disney's Magnolia (4 stars), and Disney's Lake Buena Vista (4 stars). There is also a nine-hole walking course (no electric carts allowed) called Oak Trail, designed for young golfers. The Magnolia and Palm courses played home to the PGA Tour's Children's Miracle Network Hospitals Classic. Arnold Palmer Golf Management manages the Disney golf courses. Additionally, there are two themed miniature golf complexes, each with two courses, Fantasia Gardens and Winter Summerland. 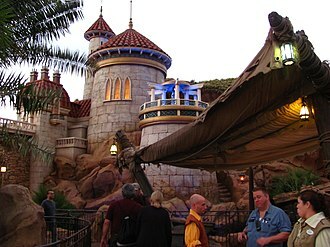 The two courses at Fantasia Gardens are Fantasia Garden and Fantasia Fairways. The Garden course is a traditional miniature-style course based on the "Fantasia" movies with musical holes, water fountains and characters. Fantasia Fairways is a traditional golf course on miniature scale having water hazards and sand traps. The two courses at Winter Summerland are Summer and Winter, both themed around Santa. Summer is the more challenging of the two 18-hole courses. Discovery Island — an island in Bay Lake that was home to many species of animals and birds. It opened on April 8, 1974, and closed on April 8, 1999. Disney's River Country — the first water park at the Walt Disney World Resort. 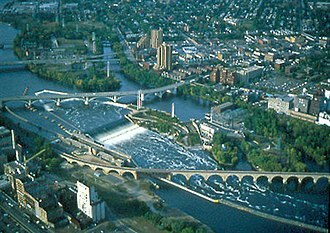 It opened on June 20, 1976, and closed on November 2, 2001 due in part to its small size, but also due to the conditions of the water being deemed unacceptable. Walt Disney World Speedway — a racetrack at Walt Disney World and included the Richard Petty Driving Experience. It opened November 28, 1995, and closed on August 9, 2015. DisneyQuest — an indoor interactive theme park that featured many arcade games and virtual attractions. It opened June 19, 1998 as part of an unsuccessful attempt to launch a chain of similar theme parks. It closed on July 2, 2017 to be replaced by the NBA Experience. La Nouba by Cirque du Soleil — opened December 23, 1998, and closed after December 31, 2017. While all of the Deluxe resort hotels have achieved an AAA Four Diamond rating, Disney's Grand Floridian Resort & Spa is considered the highest tier flagship luxury resort on the Walt Disney World Resort complex. The Golf Resort — Became The Disney Inn, and later became Shades of Green. Disney's Village Resort — Became the Villas at Disney Institute and then Disney's Saratoga Springs Resort & Spa. The "Tree House" Villas were decommissioned for a time because they were not accessible to disabled guests. Until early 2008, they were used for International Program Cast Member housing. In February 2008, Disney submitted plans to the South Florida Water Management District to replace the 60 existing villas with 60 new villas. The Treehouse Villas opened during the summer of 2009. Celebration — a town designed and built by Disney, now managed by a resident-run association. Star Wars Hotel — planned to be built on the south side of Disney's Hollywood Studios, just east of World Drive and just outside of the under-construction Star Wars: Galaxy's Edge land theme park planning to open in 2019. Disney Riviera Resort — Disney's 15th Vacation Club property, the 300-unit resort is slated to open in the fall of 2019, and will be served by the new Disney Skyliner gondola lift system. Guests with a Disney Resort reservation (excluding the Walt Disney World Swan and Dolphin) that arrive at Orlando International Airport can be transported to their resort from the airport using the complimentary Disney's Magical Express service, which is operated by Mears Destination Services. Guests can also have their bags picked up and transported to their resort for them through a contract with BAGS Incorporated on participating airlines. Many resorts feature Airline Check-in counters for guests returning to the airport. Here their bags will be checked all the way through to their final destination and they can also have boarding passes printed for them. Some participating airlines are Delta, United, American, JetBlue, Southwest and Alaska Airlines. In 2014, the resort's four theme parks all ranked in the top 8 on the list of the 25 most visited theme parks in the world; (1st) Magic Kingdom - 19,332,000 visitors, (6th) Epcot - 11,454,000 visitors, (7th) Disney's Animal Kingdom - 10,402,000 visitors, and (8th) Disney's Hollywood Studios - 10,312,000 visitors. The Walt Disney World Monorail System provides free transport across the resort. The Walt Disney World Resort is serviced by Disney Transport, a complimentary mass transportation system allowing guest access across the property. 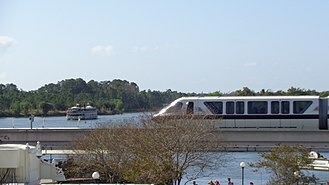 The Walt Disney World Monorail System provides free transportation at Walt Disney World; guests can board the monorail and travel between the Magic Kingdom and Epcot, including select on-property resorts such as The Grand Floridian and The Polynesian Village. The system operates on three routes that interconnect at the Transportation and Ticket Center (TTC), adjacent to the Magic Kingdom's parking lot. Disney Transport owns a fleet of Disney-operated buses on property, that is also complimentary for guests. Disney Transport also operates a fleet of watercraft, ranging in size from water taxis, up to the ferries that connect the Magic Kingdom to the Transportation and Ticket Center. Disney Transport is also responsible for maintaining the fleet of parking lot trams that are used for shuttling visitors between the various theme park parking lots and their respective main entrances. A gondola lift system, dubbed Disney Skyliner, is expected to open in late 2019. The system's three lines will connect Disney's Hollywood Studios and Epcot with four resort hotels. In addition to its free transportation methods, in conjunction with Lyft, Walt Disney World also offers an on-demand transportation service for a fee. The Minnie Van Service are minivans dressed in a Minnie Mouse red-and-white polka dot design that can accommodate up to six people and have two carseats available to anyone that is within the Walt Disney World Resort limits. Walt Disney World previously had its own small airport: the Walt Disney World Airport which was also known as the Lake Buena Vista STOLport. During the early 1970s, scheduled passenger service was operated by Shawnee Airlines with small de Havilland Canada DHC-6 Twin Otter commuter turboprops which had STOL (short take off and landing) capabilities on flights to Tampa and Orlando. The airport is no longer in operation. When the Magic Kingdom opened in 1971, the site employed about 5,500 "cast members". Today, Walt Disney World employs more than 74,000 cast members, spending more than $1.2 billion on payroll and $474 million on benefits each year. The largest single-site employer in the United States, Walt Disney World has more than 3,700 job classifications. The resort also sponsors and operates the Walt Disney World College Program, an internship program that offers American college students (CP's) the opportunity to live about 15 miles (24 km) off-site in four Disney-owned apartment complexes and work at the resort, and thereby provides much of the theme park and resort "front line" cast members. There is also the Walt Disney World International College Program, an internship program that offers international college students (ICP's) from all over the world the same opportunity. Walt Disney World requires an estimated 1,000,000,000 kilowatt-hours (3.6×109 MJ) of electricity annually, costing the company nearly $100 million in annual energy consumption. In addition to relying primarily on fossil fuels and nuclear energy from the state's power grid, Walt Disney World has two solar energy facilities on property; a 22 acres (0.034 sq mi; 0.089 km2) Mickey Mouse-shaped solar panel farm near Epcot, and a 270 acres (0.42 sq mi; 1.1 km2) facility near Disney's Animal Kingdom. The larger facility produces enough solar energy to provide electricity to two of the resort's theme parks. The sites are operated by Duke Energy and the Reedy Creek Improvement District, respectively. The entire Disney Transport bus fleet uses R50 renewable diesel fuel, obtained from used cooking oil and non-consumable food waste from the resort. Walt Disney World's corporate culture uses jargon based on theatrical terminology. For example, park visitors are always "guests", employees are called "cast members", rides are "attractions" or "experiences", cast members costumed as famous Disney characters in a way that does not cover their faces are known as "face characters", jobs are "roles", and public and nonpublic areas are respectively labeled "onstage" and "backstage". Disney's security personnel are generally dressed in typical security guard uniforms, though some of the personnel are dressed as tourists in plain clothes. Since September 11, 2001, uniformed security has been stationed just outside each Disney park in Florida to search guests' bags as they enter the parks. Despite the appearance of the uniformed security personnel, they are not considered a legal law enforcement agency. Disney and The Reedy Creek Improvement District were sued for access to Disney Security records by Bob and Kathy Sipkema following the death of their son at the resort in 1994. The court characterized Disney security as a "night watchman" service not a law enforcement agency and was not subject to Florida's open records laws. An appeals court later upheld the lower court's ruling. In late 2015, Disney confirmed the addition of randomized secondary screenings and dogs trained to detect body-worn explosives within parks, in addition to metal detectors at entrances. It has also increased the number of uniformed security personnel at Walt Disney World and Disneyland properties. Disney Security personnel in Florida have investigated traffic accidents and issued accident reports. The forms used by Disney Security may be confused with official, government forms by some. The Orange County Sheriff maintains an office on Disney property, but this is primarily to process guests accused of shoplifting by Disney security personnel. Although the scattering of ashes on Disney property is illegal, The Wall Street Journal reported in October 2018 that Walt Disney World parks were becoming a popular spot for families to scatter the ashes of loved ones, with the Haunted Mansion at Magic Kingdom being the favorite location. The practice is unlawful and prohibited on Disney property, and anyone spreading cremated remains would be escorted from the park. Like its sister park, the park may close early to accommodate various special events, such as special press events, tour groups, VIP groups, and private parties. It is common for a corporation to rent the entire park for the evening. In such cases, special passes are issued which are valid for admission to all rides and attractions. At the ticket booths and on published schedules, the guests are notified of the early closures. Then, cast members announce that the park is closing, sometime before the private event starts, and clear the park of guests who do not have the special passes. ^ a b "Disney donates $1 million to help those affected by Orlando massacre". 7 News Miami. Archived from the original on September 19, 2016. Retrieved September 16, 2016. ^ a b "Walt Disney World Fun Facts". Walt Disney World News. Retrieved June 11, 2018. ^ "10 Most Popular Theme Parks in the World". uscitytraveler.com. US City Traveler. June 2, 2014. Archived from the original on September 21, 2015. Retrieved October 4, 2015. ^ a b Fogleson, Richard E. (2003). Married to the Mouse. New Haven, CT: Yale University Press. p. 274. ISBN 978-0-300-09828-0. ^ a b Mannheim, Steve (2002). Walt Disney and the Quest for Community. Aldershot, Hampshire, England: Ashgate Publishing Limited. pp. 68–70. ISBN 978-0-7546-1974-1. ^ Koenig, David (2007). Realityland: True-Life Adventures at Walt Disney World. Irvine, CA: Bonaventure Press. pp. 25–26. ISBN 978-0-9640605-2-4. ^ "Disney Assembled Cast Of Buyers To Amass Land Stage For Kingdom". tribunedigital-orlandosentinel. Archived from the original on September 3, 2014. ^ a b c d e f g h Mark Andrews (August 6, 2000). "Disney Pulled Strings So Mouse Moved In With Barely A Squeak". orlandosentinel.com. Tribune Newspapers. Archived from the original on September 10, 2015. Retrieved September 10, 2015. ^ Thomas, Bob (1994). Walt Disney - An American Original. p. 357. Archived from the original on October 24, 2015. Retrieved September 21, 2015. ^ a b "Disney World Florida opens next Friday". Times-News. Hendersonville, North Carolina. UPI. September 27, 1971. p. 11. 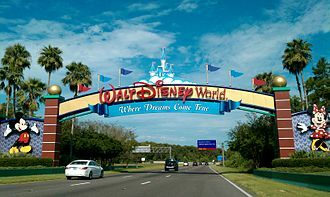 ^ "Walt Disney World opens Florida gates". Lodi News-Sentinel. California. UPI. October 2, 1971. p. 10. ^ "Backstage brain Roy Disney dies". St. Petersburg Independent. Florida. Associated Press. December 21, 1971. p. 10-A. ^ Pedicini, Sandra (January 22, 2016). "Walt Disney World announces management reorganization". Archived from the original on August 27, 2016. Retrieved August 17, 2016. ^ Trejos, Nancy. "Dogs now welcome at Disney World resorts". USA TODAY. ^ a b c d e "Walt Disney World closes for just fourth time ever as Hurricane Matthew nears". cnbc.com. CNBC. October 6, 2016. Archived from the original on October 11, 2016. Retrieved October 12, 2016. ^ "Hurricane Irma causes Disney World to close for sixth time in nearly 50 years". Fox News. September 10, 2017. Archived from the original on September 10, 2017. Retrieved September 11, 2017. ^ "12 Days of Disney Parks Christmas: New Images of the Disney Skyliner Transportation System". Disney Parks Blog. Retrieved May 30, 2018. ^ "We Have More Information About the Disney Skyliner Transportation System Coming to Walt Disney World". Oh My Disney. December 8, 2017. Retrieved January 30, 2018. ^ a b Russon, Gabrielle. "Disney's gondola system picks up $3.8 million worth of electrical work". OrlandoSentinel.com. Retrieved June 12, 2018. ^ "Disney's BoardWalk". Walt Disney World. Retrieved January 30, 2018. ^ Levine, Arthur (June 1, 2016). 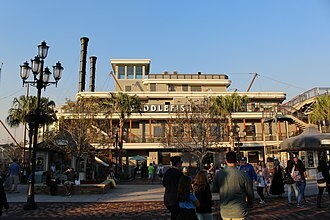 "Disney Springs: The story behind Disney World's former Downtown Disney". USA Today. Archived from the original on June 1, 2016. Retrieved June 1, 2016. ^ Jason Garcia (August 24, 2011). "Disney golf: Disney World to turn its golf courses over to Arnold Palmer". Orlando Sentinel. Archived from the original on December 1, 2011. Retrieved April 22, 2013. ^ Barnes, Susan B. (July 27, 2015). "Putt putt your way across the USA". Detroit Free Press. USA TODAY. Archived from the original on August 28, 2016. Retrieved July 28, 2016. ^ a b Adams, Emily. "Walt Disney World Mini Golf". USA Today. studioD. Archived from the original on October 19, 2015. Retrieved July 28, 2016. ^ Sandra Pedicini (June 30, 2015). "DisneyQuest closing at Downtown Disney". orlandosentinel.com. Tribune Newspapers. Archived from the original on July 1, 2015. Retrieved June 30, 2015. ^ Bevil, Dewayne; Palm, Matthew J. "Cirque du Soleil's 'La Nouba' to close at Disney". OrlandoSentinel.com. Archived from the original on March 4, 2017. Retrieved March 4, 2017. ^ "Treehouse Villas To Be Replaced By New Treehouses At Walt Disney World". Netcot.com. February 12, 2008. Archived from the original on May 20, 2008. Retrieved September 8, 2008. ^ "Update on the Star Wars Immersive Resort Planned for Walt Disney World Resort". Disney Parks Blog. Retrieved May 30, 2018. ^ "D23 EXPO 2017: New Disney Riviera Resort hotel announced for Walt Disney World to connect to Disney Skyliner | Inside the Magic". Inside the Magic. July 15, 2017. Retrieved May 30, 2018. ^ "Disney World's Magic Kingdom Tops The List Of The 25 Most Visited Theme Parks In The World". dwtickets.com. OrlandoTastic. Retrieved October 4, 2015. ^ "TEA/AECOM 2008 Global Attractions Report" (PDF). Themed Entertainment Association. 2008. Archived (PDF) from the original on March 2, 2013. Retrieved November 20, 2012. ^ "TEA/AECOM 2012 Global Attractions Report" (PDF). Themed Entertainment Association. 2012. Archived (PDF) from the original on December 24, 2015. Retrieved April 18, 2014. ^ "TEA/AECOM 2013 Global Attractions Attendance Report" (PDF). Themed Entertainment Association/AECOM. 2014. Retrieved May 27, 2016. ^ Rubin, Judith; Au, Tsz Yin (Gigi); Chang, Beth; Cheu, Linda; Elsea, Daniel; LaClair, Kathleen; Lock, Jodie; Linford, Sarah; Miller, Erik; Nevin, Jennie; Papamichael, Margreet; Pincus, Jeff; Robinett, John; Sands, Brian; Selby, Will; Timmins, Matt; Ventura, Feliz; Yoshii, Chris. "TEA/AECOM 2014 Theme Index & Museum Index: The Global Attractions Attendance Report" (PDF). aecom.com. Themed Entertainment Association (TEA). Retrieved June 4, 2015. ^ "TEA/AECOM 2015 Global Attractions Attendance Report" (PDF). Themed Entertainment Association. 2015. Archived (PDF) from the original on July 3, 2016. Retrieved May 25, 2016. ^ Au, Tsz Yin (Gigi); Chang, Bet; Chen, Bryan; Cheu, Linda; Fischer, Lucia; Hoffman, Marina; Kondaurova, Olga; LaClair, Kathleen; Li, Shaojin; Linford, Sarah; Marling, George; Miller, Erik; Nevin, Jennie; Papamichael, Margreet; Robinett, John; Rubin, Judith; Sands, Brian; Selby, William; Timmins, Matt; Ventura, Feliz; Yoshii, Chris (June 1, 2017). "TEA/AECOM 2016 Theme Index & Museum Index: Global Attractions Attendance Report" (PDF). aecom.com. Themed Entertainment Association. Retrieved July 26, 2017. ^ "TEA/AECOM 2017 Global Attractions Attendance Report" (PDF). Themed Entertainment Association. 2017. Retrieved May 27, 2018. ^ "Minnie Van™ Service". Walt Disney World. ^ "Lyft-Powered Minnie Van™ Service Launches at Walt Disney World". Lyft. ^ "Disney World's Grand Opening". www.thisdayindisneyhistory.com. ^ "Disney Profile". Hospitality Online. Archived from the original on September 27, 2007. Retrieved July 7, 2007. ^ Grant, Rich (March 18, 2015). 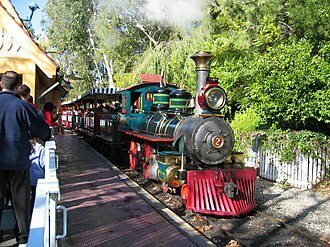 "How Walt Disney's Love of Trains Changed the World". Huffington Post. Archived from the original on March 18, 2016. Retrieved April 3, 2017. 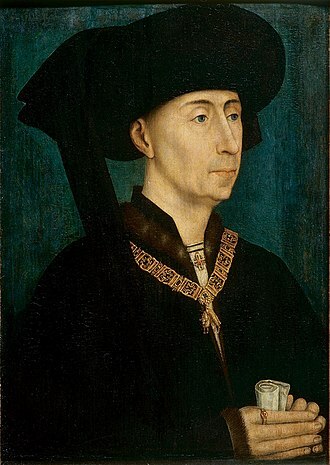 ^ Conca, James (February 21, 2019). "Disney World Could Have Gone Nuclear". Forbes. Retrieved March 7, 2019. ^ a b c Hiller, Jake (January 28, 2019). "Why Disney World Is Betting On Clean Energy". Forbes. Retrieved March 7, 2019. ^ a b Sehlinger, Bob; Testa, Len (2014). The Unofficial Guide to Walt Disney World 2014. Birmingham, AL: Keen Communications. pp. 14–15. ISBN 9781628090000. ^ a b Mohney, Chris (2006). 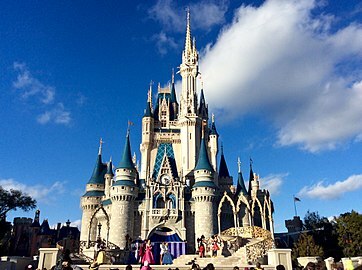 Frommer's Irreverent Guide to Walt Disney World. Hoboken, NJ: Wiley Publishing, Inc. p. 115. ISBN 9780470089880. ^ Foglesong, Richard E. (2003). Married to the Mouse. Yale University Press. pp. 69, 139. ISBN 978-0-300-09828-0. ^ Pastor, James F. (2006). Security Law and Methods. Butterworth-Heinemann. pp. 505–512. ISBN 978-0-7506-7994-7. ^ Louissant, Moise. "The Walt Disney Company: A Case Study in Private Security Trends". Fast Guard Service. Retrieved January 29, 2016. ^ Schweizer, Peter; Rochelle Schweizer (1998). Disney: The Mouse Betrayed : Greed, Corruption, and Children at Risk. Regnery Publishing. pp. 65–68. ISBN 978-0-89526-387-2. ^ Schwartzel, Eric (October 24, 2018). "Disney World's Big Secret: It's a Favorite Spot to Scatter Family Ashes". The Wall Street Journal. Retrieved October 24, 2018. ^ Hooks, Danielle (September 8, 2017). "Disney World to close for fifth time in history in preparation for Hurricane Irma". WTKR-TV. Interstate 4 is a 132. 298-mile-long Interstate Highway in the U. S. state of Florida, along a southwest–northeast axis from I-275 in Tampa to I-95 at Daytona Beach. The entirety of I-4 overlaps nearly the entirety of State Road 400, the first segment of I-4 opened to traffic in 1959 and the highway was largely completed in 1967. The median of I-4 between Tampa and Orlando was the route of a high-speed rail line between these cities, which was cancelled in 2011. The I-4 corridor is a region in politics, due to the large number of undecided voters in a large swing state. I-4 maintains a diagonal, northeast–southwest route for much of its length, the 132-mile-long highways western terminus is with an interchange with Interstate 275—known as Malfunction Junction— near downtown Tampa and is the starting point for mile markers and exit numbers. Just east of Malfunction Junction, I-4 passes along the side of Tampas Ybor City district. I-4 continues east past the Florida State Fairgrounds towards an interchange with Interstate 75. After passing near the suburbs of Hillsborough County—including Brandon and Plant City—it enters Polk County. Just after the junction with the Polk Parkway, I-4 turns from an eastward to a northeastward heading. Between SR33 and US27, I-4 passes through the fog-prone Green Swamp, ten variable-message signs and dozens of cameras & vehicle detection systems monitor this stretch of mostly-rural highway as a result of several large, deadly pile-ups caused by dense fog. The single GreeneWay/World Drive exit marks a change from rural to suburban/urban landscape. The highway passes beside Celebration and Kissimmee on the east side, for the next 40 miles, I-4 passes through the Orlando metropolitan area, where the highway forms the main north-south artery. Orlandos main tourist strip—International Drive—runs parallel and no more than 1.5 mi from I-4 between Kissimmee and Floridas Turnpike, between Michigan St. and Kaley Ave. I-4 changes to a north heading past downtown Orlando and its northern suburbs. An amusement park or theme park is a group of entertainment attractions and other events in a location for the enjoyment of large numbers of people. Theme parks, a type of amusement park, are usually much more intricately themed to a certain subject or group of subjects than normal amusement parks. Amusement parks evolved from European fairs and pleasure gardens, which were created for peoples recreation, Worlds fairs and expositions were another influence on the development of the amusement park industry. In common language, the theme park and amusement park are often synonymous. However, a park can be regarded as a distinct style of amusement park. 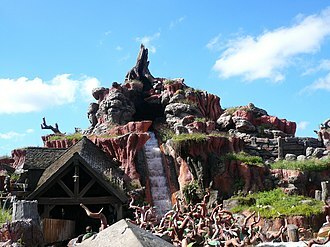 A theme park has landscaping and attractions that are based on one or more specific themes or stories. The amusement park evolved from three earlier traditions, the oldest being the periodic fair of the Middle Ages - one of the earliest was the Bartholomew Fair in England, the worlds oldest amusement park appeared in the Continent. Bakken at Klampenborg, north of Copenhagen, opened in 1583, a wave of innovation in the 1860s and 1870s created mechanical rides, such as the steam-powered carousel, and its derivatives. This inaugurated the era of the modern funfair ride, as the classes were increasingly able to spend their surplus wages on entertainment. The second influence was the pleasure garden, one of the earliest gardens was the Vauxhall Gardens, founded in 1661 in London. By the late 18th century, the site had a fee for its many attractions. It regularly drew crowds, with its paths being noted for romantic assignations, tightrope walkers, hot air balloon ascents, concerts. Although the gardens were designed for the elites, they soon became places of great social diversity. Public firework displays were put on at Marylebone Gardens, and Cremorne Gardens offered music, prater in Vienna, was opened in 1766. The concept of a park for amusement was further developed with the beginning of the worlds fairs. The first World fair began in 1851 with the construction of the landmark Crystal Palace in London, the purpose of the exposition was to celebrate the industrial achievement of the nations of the world and it was designed to educate and entertain the visitors. Epcot is a theme park at the Walt Disney World Resort in Bay Lake, near Orlando. It is owned and operated by the Walt Disney Company through its Parks, inspired by an unrealized concept developed by Walt Disney, the park opened on October 1,1982, and was the second of four theme parks built at Walt Disney World, after the Magic Kingdom. The park is divided two sections, Future World, made up eight pavilions, and World Showcase, themed to eleven world nations. In 2015, the park hosted approximately 11.98 million guests, ranking it the third most visited park in North America. The park is represented by Spaceship Earth, a sphere that serves as an attraction. Epcot was known as EPCOT Center until 1994 when it was renamed Epcot 94, Epcot 95, the theme park opened on October 1,1982. The dedication plaque near the states, To all who come to this place of joy and friendship. Epcot Center is inspired by Walt Disneys creative genius, human achievements are celebrated through imagination, the wonders of enterprise, and concepts of a future that promises new and exciting benefits for all. May Epcot Center entertain and inspire, above all, may it instill a new sense of belief and pride in mans ability to shape a world that offers hope to people everywhere. The parks name, EPCOT, is an acronym for Experimental Prototype Community of Tomorrow, in Walt Disneys words, EPCOT will take its cue from the new ideas and new technologies that are now emerging from the creative centers of American industry. It will be a community of tomorrow that will never be completed but will always be introducing and testing, and EPCOT will always be a showcase to the world of the ingenuity and imagination of American free enterprise. His original vision was for a community which would have been home to twenty thousand residents. This radial plan concept is influenced by British planner Ebenezer Howard. Transportation would have been provided by monorails and PeopleMovers Automobile traffic would be kept underground, the remaining portion of the model is visible on the left behind glass. Walt Disney was not able to obtain funding and permission to work on his Florida property until he agreed to first build Magic Kingdom. The Walt Disney World Resort is an entertainment complex in Bay Lake and Lake Buena Vista, near Orlando and Kissimmee, Florida. The resort is the destination of Disneys worldwide corporate enterprise. Opened on October 1,1971, Walt Disney World is the most visited vacation resort in the world, the resort is owned and operated by Walt Disney Parks and Resorts, a division of The Walt Disney Company. It was initially operated by Walt Disney World Company, Magic Kingdom was the first theme park to open in the complex, in 1971, followed by Epcot in 1982, Disneys Hollywood Studios in 1989, and the most recent, Disneys Animal Kingdom in 1998. Designed to supplement Disneyland in Anaheim, which had opened in 1955, the Florida Project, as it was known, was intended to present a distinct vision with its own diverse set of rides. 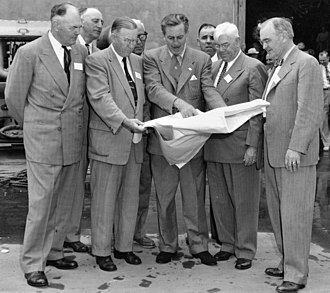 Walt Disneys original plans called for the inclusion of an Experimental Prototype Community of Tomorrow. Walt Disney died on December 15,1966, before construction began, without Disney spearheading the construction, the company created a resort similar to Disneyland, abandoning experimental concepts for a planned community. In 1959, Walt Disney Productions began looking for land to house a second resort to supplement Disneyland in Anaheim, which had opened in 1955. Market surveys at the revealed that only 5% of Disneylands visitors came from east of the Mississippi River. Additionally, Walt Disney disliked the businesses that had sprung up around Disneyland, Walt Disney flew over a potential site in Orlando, Florida – one of many – in November 1963. To avoid a burst of land speculation, Walt Disney World Company used various dummy corporations to acquire 30,500 acres of land, in May 1965, some of these major land transactions were recorded a few miles southwest of Orlando in Osceola County. In addition, two tracts totaling $1. Some are now memorialized on a window above Main Street, U. S. A. in Magic Kingdom, the smaller parcels of land acquired were called outs. 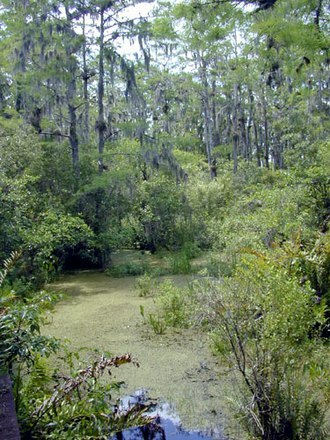 They were 5-acre lots platted in 1912 by the Munger Land Company, most of the owners in the 1960s were happy to get rid of the land, which was mostly swamp at the time. Kissimmee is a city in Osceola County, United States. As of the 2010 United States Census, the population was 59,682 and it is the county seat of Osceola County. Kissimmee is a Principal City of the Orlando-Kissimmee-Sanford, Metropolitan Statistical Area, the area was originally named Allendale, after Confederate Major J. H. Allen who operated the first cargo steamboat along the Kissimmee River – the Mary Belle. 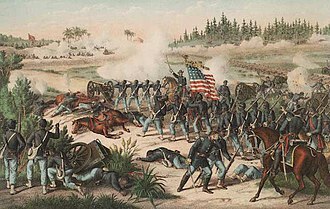 It was renamed Kissimmee when incorporated as a city in 1883, the etymology of the name Kissimmee is debated, apart from general agreement that it is Native American in origin. 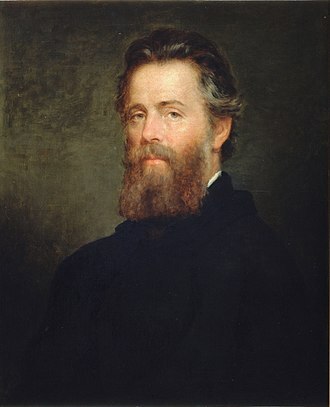 Its growth can be credited to Hamilton Disston of Philadelphia, who based his four-million acre drainage operation out of the small town, Disston had contracted with the financially wobbly state of Florida to drain its southern lands, for which he would own half of all he successfully drained. 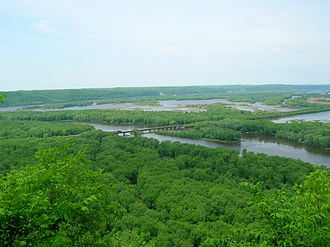 This deal made Disston the largest single landowner in the United States, disstons dredging and land speculation required a small steamboat industry to transport people and goods along the new waterway. The Kissimmee shipyard was responsible for building most of large steamships. Concurrently, the South Florida Railroad was growing and extended the end of its line from Sanford down to Kissimmee, on February 12,1885, the Florida Legislature incorporated the Kissimmee City Street Railway. But the heyday of Kissimmee was short-lived, expanding railroads began to challenge the steamships for carrying freight and passengers. By 1884, the South Florida Railroad, now part of the Plant System, had extended its tracks to Tampa, the Panic of 1893 was the worst depression the U. S. had experienced up to that time, crushing land speculation and unsound debt. 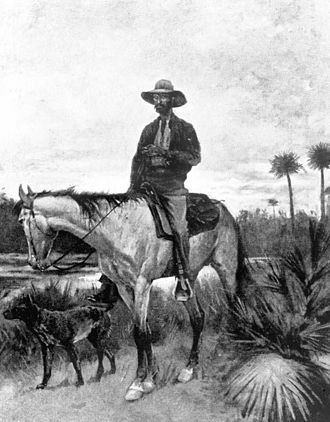 Hamilton Disston closed his Kissimmee land operation, consecutive freezes in 1894 and 1895 wiped out the citrus industry. The freezes, combined with South Floridas growth and the relocation of operations to Lake Okeechobee. Kissimmee had a population of 4,310 in 1950, at that point there was some citrus packing as well as the ranching. Ranching remained an important part of the economy until the opening of nearby Walt Disney World in 1971. The Walt Disney Company, commonly known as Disney, is an American diversified multinational mass media and entertainment conglomerate, headquartered at the Walt Disney Studios in Burbank, California. It is the second largest media conglomerate in terms of revenue. Disney was founded on October 16,1923 – by brothers Walt Disney, the company operated under the names The Walt Disney Studio and Walt Disney Productions. Taking on its current name in 1986, it expanded its operations and started divisions focused upon theater, music, publishing. In addition, Disney has since created corporate divisions in order to more mature content than is typically associated with its flagship family-oriented brands. The company is best known for the products of its studio, Walt Disney Studios. Disneys other three divisions are Walt Disney Parks and Resorts, Disney Media Networks, and Disney Consumer Products. The company has been a component of the Dow Jones Industrial Average since May 6,1991, Mickey Mouse, an early and well-known cartoon creation of the company, is a primary symbol and mascot for Disney. In early 1923, Kansas City, animator Walt Disney created a film entitled Alices Wonderland. After the bankruptcy in 1923 of his previous firm, Laugh-O-Gram Studios, Disney moved to Hollywood to join his brother and Roy Disney formed Disney Brothers Cartoon Studio that same year. More animated films followed after Alice, in January 1926, with the completion of the Disney studio on Hyperion Street, the Disney Brothers Studios name was changed to the Walt Disney Studio. The distributor owned Oswald, so Disney only made a few hundred dollars, Disney completed 26 Oswald shorts before losing the contract in February 1928, due to a legal loophole, when Winklers husband Charles Mintz took over their distribution company. After failing to take over the Disney Studio, Mintz hired away four of Disneys primary animators to start his own animation studio, Snappy Comedies. In 1928, to recover from the loss of Oswald the Lucky Rabbit, Disney came up with the idea of a character named Mortimer while on a train headed to California. Orlando is a city in the U. S. state of Florida and the county seat of Orange County. Located in Central Florida, it is the center of the Orlando metropolitan area, which had a population of 4,000,002, according to U. S. As of 2015, Orlando had an estimated population of 270,934, making it the 73rd-largest city in the United States, the fourth-largest city in Florida. The City of Orlando is nicknamed The City Beautiful, and its symbol is the fountain at Lake Eola, Orlando is known as The Theme Park Capital of the World and in 2014 its tourist attractions and events drew more than 62 million visitors. 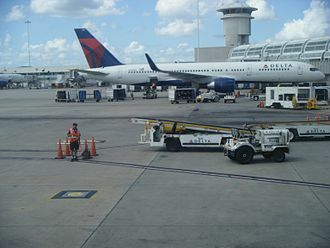 The Orlando International Airport is the thirteenth-busiest airport in the United States, with the exception of Walt Disney World, most major attractions are located along International Drive. The city is one of the busiest American cities for conferences and conventions. Orlando is home to the University of Central Florida, which is the largest university campus in the United States in terms of enrollment as of 2015, in 2010, Orlando was listed as a Gamma− level of world-city in the World Cities Study Groups inventory. Orlando ranks as the fourth-most popular American city based on where people want to live according to a 2009 Pew Research Center study. Fort Gatlin, as the Orlando area was known, was established at what is now just south of the city limits by the 4th U. S. Artillery under the command of Ltc, alexander C. W. Fanning on November 9,1838 during the construction of a series of fortified encampments across Florida during the Second Seminole War. The fort and surrounding area were named for Dr. John S. Gatlin, king Phillip and Coacoochee frequented this area and the tree was alleged to be the place where the previous 1835 ambush that had killed over 100 soldiers had been planned. When the U. S. military abandoned the fort in 1839 the surrounding community was built up by settlers, prior to being known by its current name, Orlando was once known as Jernigan. Aarron Jernigan became Orange Countys first State Representative in 1845 but his pleas for military protection went unanswered. Fort Gatlin was briefly reoccupied by the military for a few weeks during October and November 1849, a historical marker indicates that by 1850 the Jernigan homestead served as the nucleus of a village named Jernigan. The ESPN Wide World of Sports Complex is a 220 acres athletic complex located in the Walt Disney World Resort, in Bay Lake, near Orlando, Florida. The complex includes 9 venues and hosts numerous amateur and professional sporting events throughout the year and it was known as Disneys Wide World of Sports Complex from 1997 until 2010 when it was re-branded with the Disney-owned ESPN brand. The rebranding was unveiled on February 25,2010 and it served as the home of the Orlando City Soccer Club for the 2014 season. Disney built the US$100 million facility on former wetlands under the direction of Disney Vice President Reggie Williams, the venue opened in March 1997 with an exhibition baseball game between the Atlanta Braves and the Cincinnati Reds. Initial tenants were Braves, the Harlem Globetrotters, NFL Experience, on May 13,2008, The Walt Disney Company announced plans to rebrand Disneys Wide World of Sports using the ESPN brand. On November 5,2009, Disney announced that the complex would be renamed ESPN Wide World of Sports Complex, the rebranding was officially unveiled during Disneys ESPN the Weekend festivities. The complex received an upgrade including the installation of HD video scoreboards at several of the venues, a new complex-wide audio system. The current admission price for ESPN Wide World of Sports Complex is $17.50 for adults, some events, particularly those at Champion Stadium, HP Field House, and Jostens Center, may require higher ticket fees, but still permit entry to the complex as a whole. A ticket is required to eat at the ESPN Wide World of Sports Grill, the Clubhouse Gift Shop can be accessed without paying for entry to the complex. A9,500 seat baseball stadium built in 1997, one of the original components of Wide World of Sports, it was formerly known as Cracker Jack Stadium and The Ballpark at Disneys Wide World of Sports. It is the training home of the Atlanta Braves and the recurring home for the Gulf Coast Braves. The stadium has hosted two regular season Major League Baseball series in 2007 and 2008 featuring the Tampa Bay Rays as the home team and it is sponsored by Hanes with their Champion brand. McCoy AFB is a former United States Air Force base located 10 miles south of Orlando, Florida. It was a base during World War II. After the war it became a Front-Line Strategic Air Command base during the Vietnam War and it was Orlandos biggest employer and economic backbone prior to the opening of Walt Disney World in 1971. McCoy Air Force Base was named for Colonel Michael Norman Wright McCoy on 7 May 1958, Col McCoy was killed on 9 October 1957 in the crash of a B-47 Stratojet, AF Ser. No. McCoy was the commander during the flight and the mishap aircraft was one of two at Pinecastle that had been modified to carry the GAM-63 RASCAL air-to-surface missile. At the time of his death, McCoy was serving as the commander of the 321st Bombardment Wing, a hugely popular figure in Central Florida, Colonel McCoy was buried at Arlington National Cemetery in a funeral that included a flyover of multiple B-47s. The facility originally was built in 1940 as a replacement civilian airport after the takeover, on 1 January 1943, it was renamed as Pinecastle Army Airfield. Pinecastle AAF was intended to support the mission of Orlando AAB. The squadrons had the mission of training combat aircrews for a wide variety bombing missions in advanced combat techniques. In addition to the mission, beginning in 1943, Pinecastle AAF was used as the AAFSAT Technical Center, operating an Air Force General Maintenance. With the drawdown and closure of wartime airfields after the German capitulation in May 1945, on 1 July 1945, jurisdiction of the field was transferred to Air Proving Ground Command at Eglin Field, Florida. The 901st AAFBU was inactivated and replaced by the 621st Base Unit, weapons tests of the VB-6 Felix infrared heat seeking and VB-3 Razon radio-controlled gliding bombs were carried out as well. In March 1946, the X-1 program was relocated to Muroc AAF, the move was a logistics issue as much as anything, as Pinecastle was deemed not suitable for the X-1 project. A move to the remote California desert ensured the X-1 project team could maintain secrecy, in addition, Muroc had an expansive landing area, thanks to the surrounding dry lakebeds, and better visibility. Disneys Typhoon Lagoon is a water theme park located at the Walt Disney World Resort in Lake Buena Vista in Orlando, Florida and is one of two operating water parks at the resort. It is the water park to open at the resort after Disneys River Country. The park, which opened on June 1,1989, is home to one of the worlds largest outdoor wave pools, the theme of the park is the Disney legend of a typhoon that wreaked havoc upon a formerly pristine tropical paradise. Ships, fishing gear and surfboards are strewn about where the storm flung them, Typhoon Lagoons mascot is “Lagoona Gator. In 2015, Typhoon Lagoon admitted approximately 2,294,000 visitors, Typhoon Lagoon operates year-round with an annual maintenance closure during either the fall or winter, during the closure, its sister park, Blizzard Beach, will remain open. Of the major parks at Disney World, Typhoon Lagoon is the one that lies within the city limits of Lake Buena Vista. Blizzard Beach and the four parks are within the adjacent city of Bay Lake. However, Lake Buena Vista is the address for the entire Walt Disney World Resort. Mount Mayday, located behind the pool, features “Miss Tilly” as well as many of the parks waterfalls. It is a mountain which not only provides launching areas for the waterslides. The main engineering works performed in 1988 and 1989 featured studies, design, as the Typhoon Lagoon was one of the first wave-makers applied to a theme park, one of its prime objectives was to produce surfable waves. Waves are generated by a 12-cell prestressed concrete tank in the background of the lagoon covered with the wreck scene. Computer modeling techniques were used at the time to study fluid-structure interaction, stress concentrations, humunga Kowabunga, Three enclosed speed slide flumes that send riders downward five stories in seconds reaching speeds of 39 mph. Storm Slides, Three body slides that send riders from a height of three stories down twisting, winding channels to a pool at the bottom. Gang Plank Falls, Family raft ride featuring large four-person inner tubes, Mayday Falls, Tube slide flume with winding rough rapids feel. A dummy corporation or dummy company is an entity created to serve as a front or cover for one or more companies. It can have the appearance of being real, but lacks the capacity to function independently, the dummy corporations sole purpose is to protect an individual or another corporation from liability in either contract or import. After the backlash from Blackwaters reckless misconduct in Iraq, the security corporation successfully obtained lucrative American contracts under several subsidiaries, Walt Disney World Companys use of Compass East Corporation, created in Delaware in 1964, is an example of a dummy corporation established in order to purchase land. 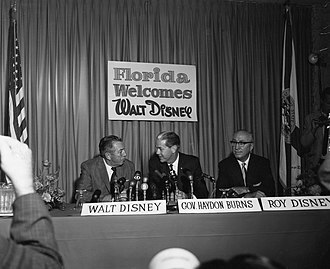 These corporations collectively purchased large masses of land in Florida that would become the Walt Disney World Resort. The dummy corporations were established in order to prevent unknowing landowners from increasing prices of the land by disguising the true plans, while Disneys use of dummy corporations are within the confines of the law, the debate of whether the land was fairly obtained is still argued. The now-defunct Japan Asia Airways was created in 1975 as an owned subsidiary company owned by Japan Airlines designed to specifically fly the Japan-Taiwan route. As the Chinese government threatened to eliminate Japan Airlines Co, ltd. s airport traffic rights coming to and from China, JAA was a solution to help decompress the politically sensitive issue. Packet Monster, Inc. was a Singaporean company in charge of running the popular Japanese forum, 2channel, the forum is infamous for sexually explicit content, extreme nationalism, and allegedly facilitating drug deals. An employee of the admitted to conducting liaison work for Packet Monster. The true management of 2Channel is yet to be discovered, and as a result, Turner now largely serves merely as a copyright holder for a portion of the Warner Bros. library. In order to conceal the nature of their missions and operations. Air America was an American passenger and cargo airline owned and operated by the Central Intelligence Agency from 1950 to 1976. Main Street, U.S.A., with Cinderella Castle in the far distance. The resort's monorail system and ferryboats transport guests to and from the Magic Kingdom. The Walt Disney World Monorail System traverses through Future World. The Twilight Zone Tower of Terror opened in 1994, as part of the park's first expansion. The Sorcerer's Hat stood at the park's hub between 2001 and 2015. Summit Plummet as seen from the beginning of the line. 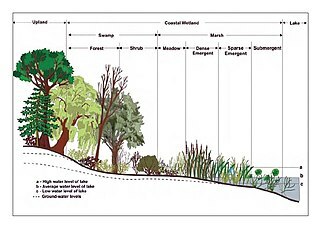 An overview of Teamboat Springs. Boeing B-52D-40-BW Stratofortress, AF Serial No. 56-0687, on display at B-52 Memorial Park, Orlando International Airport, Florida (Ex-McCoy AFB). Photo taken 4 April 2003. Postcard from Pinecastle AFB in the mid-1950s, showing the Pinecastle AFB control tower and a Boeing B-47E-90-BW Stratojet, AF Ser. No. 52-0477, of the 321st Bomb Wing on the ramp. This B-47 was sent to AMARC in November 1964. 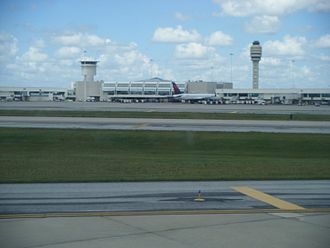 The control tower would continue to be used by McCoy AFB and as the first control tower for Orlando International Airport. Postcard from McCoy AFB in the early 1960s, showing the McCoy AFB control tower and base operations building, Boeing B-52D-5-BW Stratofortress, AF Ser. No. 55-5054, and Boeing KC-135A-BN Stratotanker, AF Ser. No. 57-1506, of the 4047th Strategic Wing. Former Iran hostage holding his fake Studio 6 card. The city's central commercial areas and Cosmopolitan Hotel. Concept art by Herbert Ryman.